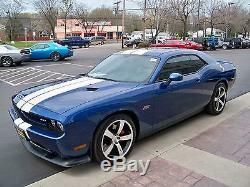 2011 DODGE CHALLENGER SRT8 392 HEMI 6 SPEED MANUAL MOONROOF BLUE W/WHITE STRIPE. Engine: 8 Cylinder, 6.4 L. 2011 DODGE CHALLENGER SRT8 392 HEMI V8. Here's your chance to own Mopar history! #248 of 392 2011 Dodge Challenger SRT8 392 in the Deep Water Blue with white stripes. This Challenger was produced in Canada for Canada and this Challenger has been converted to MPH. Standard Features of this SRT8 392. Deep Water Blue with white leather seats with blue stripes. 6.4 Liter V-8 SRT-8 Hemi with the Tremec 6 Speed manual transmission. 3.92 rear differential with anti spin. The SRT Group II (13 Speakers kicker SRT High Performance Audio, 200 Watt Kicker SRT subwoofer and 322 Watt Kicker SRT Amplifier), 30GB HDD w/4,250 song capacity, 6.5 Touch Screen display, Audio Jack input for mobile devices, Automatic temperature control, Dual white center stripes, Electronic Stability Control, Front fog lights. Garmin Navigation System, Heated front seats, High-Intessity Discharge Headlights, Media Center 430N CD/DVD/MP3/HDD/Navigation, Power driver seat, Power sunroof, Power windows, Remote Keyless entry, Sirius Satellite Radio, Travel Link, Speed control, Steering Wheel mounted audio controls, Telescoping steering wheel, and traction control. In excellent condition inside and out. If you are serious about purchasing this car we want to speak with you. We are a full service Dodge Chrysler Jeep and Ram Dealership. For over 35 years Cortese Auto Block has been providing our customers with a great selection of vehicles and a top notch service department. Call today for more information or if you would like to proceed with owning one of our vehicles! We are looking forward to meeting you! Searches its nationwide database and provides a detailed vehicle history report in seconds. Cortese Auto Group is a family owned business established in 1975 with the first dealership being Cortese Dodge. We have grown to include Chrysler, Jeep, Ford, Mitsubishi and Lincoln-Mercury. At the Cortese Auto Block you can expect award winning customer service, fair pricing and a large selection of new and quality pre-owned vehicles all on 15 acres for your convenience. We understand that your time is valuable and having researched your vehicle online you want to minimize your time in the dealership. That is why we do everything possible to make your visit to the Cortese Auto Block brief, informative and enjoyable. Research online or in person, we will respond to your requests promptly by getting you all of the information you need to make the right decision for your automotive needs. To obtain additional information, please visit one of our web pages. We will do our best to accurately describe the vehicle to the best of our knowledge regarding it's history. We will include any issues or damage in our description. Corteseautoblocknational is happy to assist you. Thank you for your interest in our auctions. Full balance can be paid by a bank loan check, cash, or if you financed through any one of our banks. We will work with any transporter you make arrangements with. We can make recommendations for transporters as well. The item "Dodge Challenger SRT8 392" is in sale since Sunday, May 08, 2016. This item is in the category "eBay Motors\Cars & Trucks\Dodge\Challenger". The seller is "corteseautoblocknational" and is located in Rochester, New York.